When you take a photo with digital camera, it’s not only the scenery and the people that was captured and stored in your memory card in a image file. Together with the image file, a metadata which contains valuable information and description about the photo is also stored internally in the digital picture file. The extra information include date and time picture was taken, width, height, resolution, bit depth, equipment make, camera model, color representation, flash mode, focal length, F-number, exposure time, ISO speed, metering mode and compensation. Not all fields of metadata is useful for everybody, as it’s mainly for classification and analysis of photos at later time. If you just need to see simple metadata about the images, Windows Explorer or any Explorer window can display the most commonly used fields of metadata – Date Picture Taken and Camera Model natively. If you save and store your images in My Pictures folder, you should be already seeing Date Picture Taken column in Windows Explorer or My Pictures window. If you don’t see it, it’s because you don’t choose the listing in Details view. To change the view of the folder, simply click on View icon or View menu, then select Details (under Layout section for Ribbon UI). The best thing about keeping your photos in My Pictures folder, folders designated as Pictures or Photo Album, or any other folders that has the “Date Taken” or “Date Picture Taken” column shown, is that you can arrange and sort the photos and pictures by Date Picture Taken On or Dimensions. 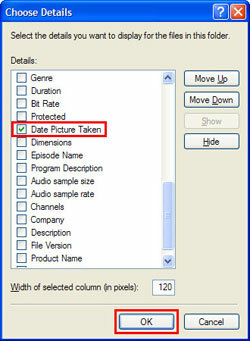 If you don’t see the “Date Picture Taken” or “Date Taken” header column in Details view, or want to add in “Camera Model” metadata to be displayed on Details view, or you don’t want to assign and customize the folder as Picture or Photo Album folder, you can enable and show both Date Picture Taken On and Camera Model as columns in the Details view of any folder. Right-click the column header area to open the column header menu options. Click Camera Model (you may need to click/tap on More before able to see Camera Model option). 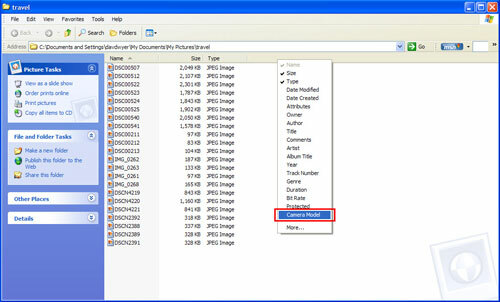 The camera model used to take each picture will be displayed in the folder, along with the file name, size, and type. By adding the Camera Model column, you can now sort the pictures in this folder based on the cameras used to take them. Here’s the step-by-step guide, workable in all Windows OS, including Windows XP, Windows Vista, Windows 7, Windows 8, Windows 8.1, Windows 10, Windows Server or later. Change to Details view if you haven’t already done so. Right-click the column header area to open the column header menu options. Click Camera Model to display the camera model used to take each picture in the folder, along with the file name, size, and type. Note: You may need to click on More at the bottom, and select the option from “Choose Details” dialog box. Right-click the column header area to open the column header menu options again. Click on More at the bottom. A “Choose Details” dialog box appears. Scroll down the list of options to locate Date Picture Taken or Date Taken. Note: In folder designated as Pictures, you will be able to see “Date Taken” or “Date Picture Taken” option without having to click on “More” link. Select (tick) the check box next to it. A green check mark will confirm that you have selected it. You can now view information on when the photos or pictures were taken on and the camera model used to shoot the photos in one listing. You can also now sort the folder image listing according to the date and time pictures was taken in chronological order and by camera model which shot the photos, simply by clicking on the column header respectively.